At this week’s SMX Advanced Seattle conference, marketers from across the globe gathered to discuss search and social best practices and myriad beasts marketers must overcome. 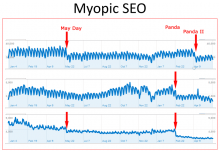 Google’s Panda update was a particularly hot topic – even months after the algorithm launched. 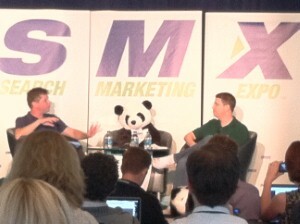 And adding to the Panda fire was Matt Cutts’ declaration that there are more Panda iterations to come. Experts offered case studies and plenty of other insights on how to practice SEO in a post-Panda search landscape. The leading takeaway points seem to have two general themes: breaking down and rebuilding. First, marketers have to break down existing notions about SEO and their affected or at-risk sites. Once they’ve accomplished this, they can work on moving forward. 1. Refocus your energies on sustainable SEO. 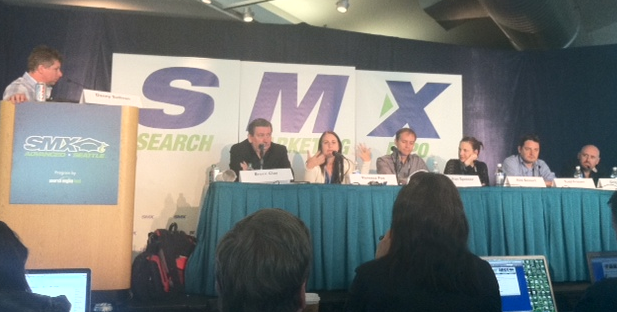 A running theme at SMX Advanced was that marketers need to change how they think of SEO. Namely, don’t think of the algorithm. 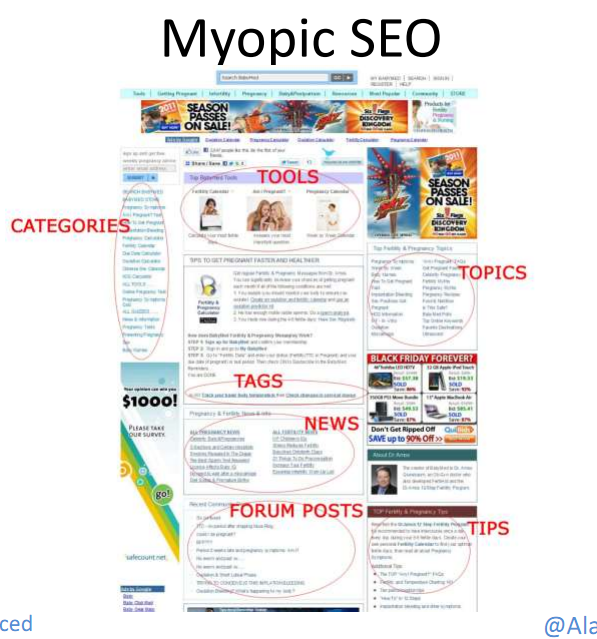 Alan Bleiweiss, Forensic SEO consultant, explained that he frequently comes across sites that struggle from “myopic SEO.” Myopic SEO refers to search strategies directed at Google’s algorithm, where people are looking for the “magic bullets” to success. He offered an example of a site that had all kinds of categories, various types of highly topical content and ads. 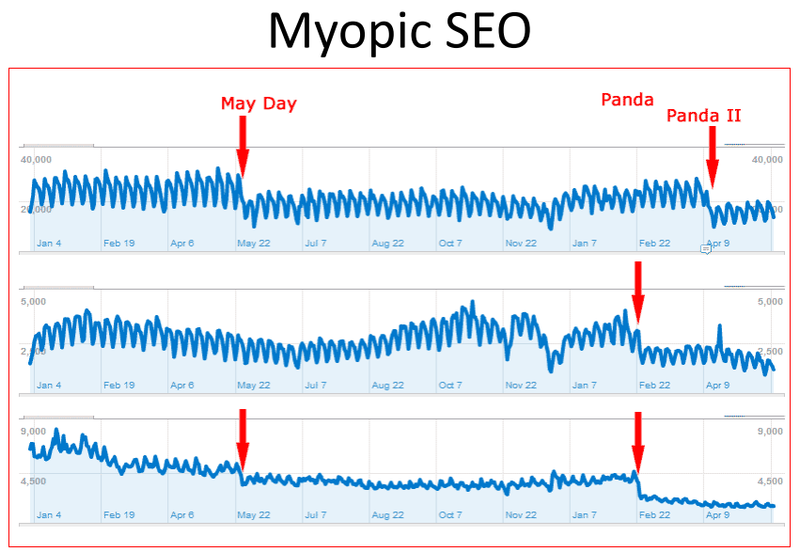 These are the types of sites that suffered from the Panda update, and they are likely to continue to struggle unless they alter their approach. 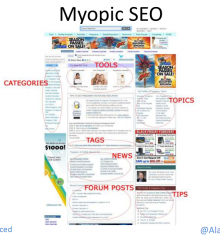 Instead of offering unique, accessible content, he described the myopic SEO site as one that crams as much shallow information as possible onto a page. The site he points to clearly lacks a focused content marketing strategy, and it fails to consider how a user will be able to navigate this page. Failure to move out of the “myopic” SEO mindset will leave you at risk of losing visibility every time Google issues a new update. Bleiweiss shared some cache reports that prove the point. Experts agreed that marketers have to get rid of dead weight content to keep their sites afloat. Todd Friesen of Performics advised businesses to determine which content pages aren’t being indexed by Google and to get rid of them, and Bruce Clay supported his theory, advocating the removal of low-quality content. Clay also asked marketers to consider the ad content on their sites and prune where possible. He encouraged marketers to maintain a generous ratio of original content to ads, and Search Engine Land has reported in the past that ad-to-content ratio might influence Panda. When you’re trying to decide which content is “poor content,” start with the obvious: which pages aren’t good reads? Greg Boser of BlueGlass Interactive went as far as to suggest that many of the site owners hit by Panda were probably aware of the fact that they were skating by with some thin content. So, first step: read over your site and find the weak pages. As an alternate option, SEO expert and author Stephan Spencer suggested marketers take their best content and move it to a new domain. Once you’ve cleaned the slate, you’ll be in a position to put sustainable SEO in practice. In the Part Two of this blog, we’ll share the insight from SMX Advanced experts on building or rebuilding your search engine optimization with Panda-friendly best practices.